Today’s defence related news includes coverage of: the new Defence Arctic Strategy; the Cadets CyberFirst programme; the British Army's presence in Germany; the naming of the fourth Type 26 frigate; the secured future of HMS Albion and HMS Bulwark; and new initiatives to support military personnel and their families. There was widespread coverage of the announcements made by the Defence Secretary yesterday. The defence announcements featured in The Telegraph, Financial Times, The Times, The Daily Mirror, The Sun, The Daily Star and The Scotsman newspapers. There was further reporting on the Mail Online and Sky News website. The strategy will enhance the MOD's focus on the Arctic, underlined by current commitments in the region and future deployments. The change in the natural environment in the Arctic and High North is driving a change in the security environment and, as the region becomes more accessible, there has been an increase in military activity. The new Defence Arctic Strategy will put the Arctic and the High North central to the security of the UK. The Cadets CyberFirst programme, delivered by MOD cadet organisations and the GCHQ National Cyber Security Centre, will equip over 2,000 cadets a year with the skills and expertise to become future leaders in this emerging industry. Over £1 million will be invested in the programme each year, giving cadets the opportunity to learn how to protect systems connected to the internet from cyber attacks. The Defence Secretary has also revealed plans to increase the number of cadets in school units to 60,000 by 2024 and celebrate their achievements through a National Cadet Week. Around 185 British Army personnel and 60 MOD civilians will remain in Germany, once the withdrawal of British Army units to the UK has been completed. Army personnel will be permanently based in the country where the UK is retaining the 45-square mile Sennelager Training Area, which provides both UK and NATO forces with an expansive live firing training area. The remaining Army personnel will also support critical NATO infrastructure and assets such as the combined river crossing capability based in Minden. HMS Birmingham is the fourth of the UK’s eventual eight Type 26 frigates to be named, with HMS Glasgow, HMS Belfast and HMS Cardiff the first three to be built. The frigates will begin to enter service in the 2020s. The Defence Secretary ended speculation about the future of amphibious assault ships HMS Bulwark and HMS Albion being withdrawn from service early. A series of new schemes and initiatives, designed to support serving personnel and their families throughout their military careers and beyond, has been announced by Defence Secretary. The new package includes: An MOD Spouse Employment Scheme; Professional and Personal Development Plan; Defence Transition Service; and Veteran ID cards. 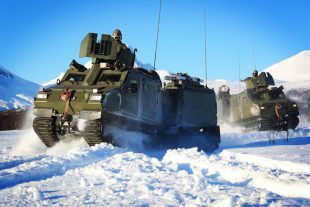 Pictured are Viking Vehicles move through deep snow around Bardufoss exercise areas during Ex Cold Enabler 2018 in Norway. Crown copyright.